One of the world's pioneers in researching and commercialising Augmented Reality (AR) will join the University of Auckland under the Entrepreneurial Universities programme established by the previous government. Professor Mark Billinghurst, who co-founded ARToolWorks – one of the first AR companies, is the second appointee under the Entrepreneurial programme to join the University’s Auckland Bioengineering Institute (ABI). “Mark will add hugely to our capability in Augmented Reality,” says the Director of ABI, Distinguished Professor Peter Hunter. I am very excited by this opportunity to join the University of Auckland and especially the ABI. 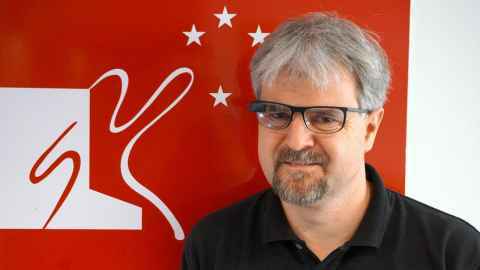 Professor Billinghurst’s commercialisation in AR stems back to his PhD at the University of Washington in 2000 when he co-created the ARToolkit Augmented Reality tracking software. ARToolKit was the first open source library for AR and solved the two important problems of camera tracking and interaction for AR. It quickly grew to be the most popular open source AR software for researchers and developers. Professor Billinghurst then founded and became director of the University of Canterbury’s HIT Lab NZ, a research institute studying the future of human computer interfaces. A total of nine companies have since spun out from his time there, including Quiver, which developed the world’s first AR colouring book. Since 2015, Professor Billinghurst has been the Director of the Empathic Computing Laboratory at the School of Information Technology and Mathematical Sciences at the University of South Australia in Adelaide, Australia. Professor Billinghurst is a Fellow of the Royal Society of New Zealand in recognition of his work on AR commercialisation and technology transfer, and has won numerous national and international awards recognising his global leadership in AR research and commercialisation. At ABI Professor Billinghurst will lead a research team comprising a senior research scientist, postdoctoral researcher and three PhD students. He will be conducting research on Empathic Computing, developing telepresence technology that will help remote people to better share their experiences and understand how they are feeling. “I am very excited by this opportunity to join the University of Auckland and especially the ABI. My research group will be exploring how AR can be combined with physiological sensing to provide next generation tele-conferencing experiences. The University of Auckland has been identified by a Massachusetts Institute of Technology (MIT) study as one of the world’s leading entrepreneurial universities “under challenging conditions”. UniServices, the commercial arm of the University of Auckland, is the top commercialisation company in Australasia (1,200 active contracts with 300 firms at any one time). The University of Auckland continues to strengthen its innovation and entrepreneurship ecosystem. It has created the new innovation hub and maker space – Unleash Space – and formed New Zealand’s first student-led investment committee, Momentum, through Return on Science. It is also committed to growing New Zealand’s innovation and entrepreneurship ecosystem, building on its innovative researcher community with support from the Entrepreneurial Universities programme and working with New Zealand businesses helping them to grow.